If you're looking for an exciting outdoor adventure trip, consider taking a vacation that combines guided float trips and camping. For a truly relaxing way to get away from it all, it's hard to beat an overnight guided float trip. This type of outing combines canoeing and camping, allowing you to spend a peaceful day on the water followed by an evening of camping under the stars on a sandbar. No matter where you live, chances are that you aren't too far away from an outdoor adventure company that offers guided float trips and camping outings. If you're interested in booking an overnight camping excursion, look for camping outfitters near where you live or will be traveling. Verify that the trip you're signing up for truly is a float trip. If you're looking for a lazy day on the water, you don't want to find out on the day of your outing that you've signed up for a physically challenging canoe outing. Find out exactly what is provided so you'll know exactly what type of gear you'll need to pack. Depending on the tour you select, you may need to take your own tent, life jacket, drinks, food, etc., or these items may be provided for you. You'll also want to find out how much time you'll spend on the water during the trip, so you can plan accordingly. Be sure to make reservations, because these trips often book up ahead of time, particularly during peak tourist seasons. On the day of your trip, you'll drive your car to the point of departure and check in. You and the other campers will board a bus or other form of shuttle transportation, and your camping guide will drive the group to an upriver spot. You'll be able to load your supplies into a canoe, and then the group will set off on the guided float trip, pulling over at a designated spot in the evening for overnight camping. Camp activities will vary depending on the specifics of the trip you selected. Many times these trips include a bonfire and cookout. Some might even include a catered meal. In the morning, you'll float to the ending point, which is likely to be the spot where you left your vehicle. If not, another shuttle will pick you and the other group members up and transport you back to your vehicle. There are opportunities to take guided float trips paired with camping in many different areas. Depending on where you're located, you might find that the following excursions offer the relaxing getaway you're looking for. If none of these trip options are in your area, check your local listings for a canoe tour company in your region. Florida: Adventures Unlimited in Milton, FL offers a variety of guided canoe and camping trip options on the Blackwater River. 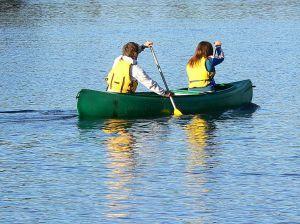 Canoeists can enjoy trips of one day or several days, camping on sandbars or in cabins. Missouri: Big Elk Camp and Canoe in Missouri offers a variety of canoe float trip options paired with an improved campground that offers tent and RV camping. You can enjoy daytime canoeing, and return to your full-hookup RV site in the evenings. Montana: Starwest Adventures offers guided float trips on the Missouri river each year from mid-May through the beginning of October. With this tour, everything you need to enjoy canoeing and camping is provided, including tents, equipment, canoes, meals, etc. If you're thinking about taking a canoe camping trip, be sure to think about the fact that your entire outing is going to be out of doors. Choose a time that you can expect the weather in the area where you'll be canoeing to be pleasant, so you'll have the best chance of enjoying a wonderful and rejuvenating outdoor adventure.